The roles the institutional research office can play as a leader and collaborator in the measurement of co-curricular learning. This is the 164th volume of this Jossey-Bass quarterly report series. Timely and comprehensive, New Directions for Institutional Research provides planners and administrators in all types of academic institutions with guidelines in such areas as resource coordination, information analysis, program evaluation, and institutional management. John F. Ryan is director of institutional research at University of Vermont. 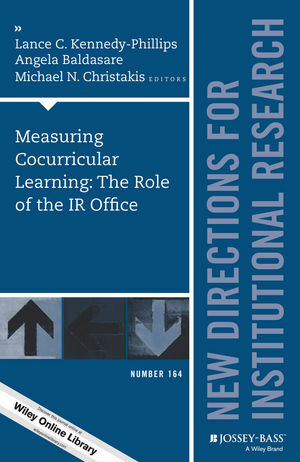 This chapter frames the discussion regarding the importance of measuring co-curricular learning and the role of the IR office. The purpose of this chapter is to provide an overview of important theories and frameworks that ground research and assessment of co-curricular learning. This chapter will explore how measuring co-curricular learning can increase an institution’s understanding of the factors that impact student success. This chapter describes how assessment of co-curricular student learning outcomes can be used as part of the institutional accreditation process and the opportunities institutional researchers and student affairs educators have to collaborate in those efforts. This chapter will discuss how institutional research professionalsmight integrate co-curricular learning outcomes into larger measures of institutional effectiveness. By mapping co-curricular learning outcomes to align with curricular and institutional goals, linkages can be made that demonstratemission-congruent activities and outcomes across the institution. This chapter explores the opportunities and challenges of using direct methods to measure co-curricular learning. This chapter explores the importance of systematic evaluation of co-curricular activities directed at graduate- and professional-school students. Approaches to assessment and benefits of sound practice are presented along with the critical role that institutional researchers can play. This chapter describes a framework to guide collaboration between institutional research and other campus offices. Three examples are then provided to illustrate how the framework was applied successfully to actual projects.